Having just co-written the Dunkirk - Air Combat Archive book for Red Kite I really wanted to paint some scenes from this fascinating part of British history. The plan was to paint the Spitfire, Hurricane and Defiant in action during Operation Dynamo when RAF Fighter Command did its best to provide continuous air cover from dawn until dusk over the Dunkirk beaches . 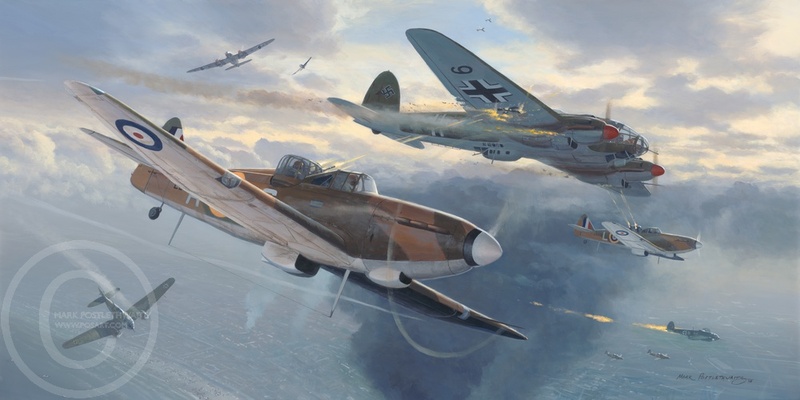 This final painting of the three shows Squadron Leader Phillip Hunter in L6973 PS-A under the starboard wing and Pilot Officer Young under the port wing in L7003 PS-L pouring fire into a Heinkel by flying in the bomber's blind spots This tactic also proved to be a success for other crews on this day and was one of many pre-planned attack profiles that the squadron had practiced.